Malcontent’s Ring in Sekiro is an item you can find, and it’s used to upgrade the Finger Whistle prosthetic tool. People have been banging their heads as to where to find the Sekiro Malcontent’s Ring. As it turns out, since this is a From Software game, it’ll require backtracking and boss-killing. 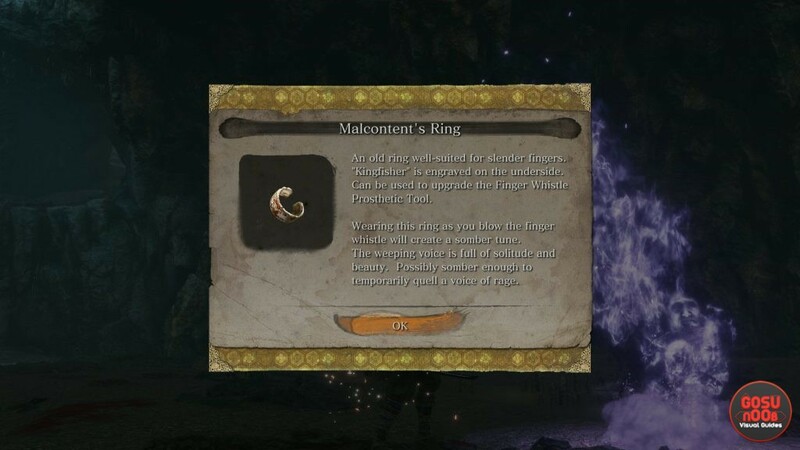 So, here’s our Sekiro Malcontent’s Ring – How to Get Finger Whistle Tool Upgrade guide to show you where to find the item. SPOILER WARNING: we’ll be discussing late-game content here. If you haven’t at least fought and killed Genichiro, bookmark us and come back when you do. Where to Find Malcontent’s Ring in Sekiro? To find the Malcontent’s Ring in Sekiro, you’ll first have to kill the Guardian Ape in Ashina Depths. This is, incidentally, on the way towards Mibu Village, where you can unlock the Mibu Breathing Technique, which allows you to stay underwater indefinitely. Basically, from the Ashina Reservoir idol, you have to go to the left and up from the huge dude with the hammer, hop from a ledge behind the pan-hitter, turn right, grapple to the ledge, and drop into the hole the NPC is looking down. Kill the boss, and continue pushing forward until you reach the Poison Pool, and the Guardian Ape just beyond it. Make sure to activate the Guardian Ape’s Burrow idol. After you defeat the Ape, you’ll have to just go further through the game. Keep an eye on the Guardian’s Ape Burrow idol status whenever you can. When it becomes grayed out, that means that the enemy you need to kill, Shichimen Warrior, has now spawned there. The easiest way to get there is to transport to the Poison Pool idol. You can activate it in the swampy area where you fight Snake Eyes Shirahagi. From there, retrace your steps to the arena where you battled the Guardian Ape. Follow the trail of blood, basically. Even before you enter the arena, you’ll see the purple fires surrounding the monster you have to slay, called Shichimen Warrior. When you manage to slay him, you’ll get the Malcontent’s Ring item, which will allow you to upgrade your Finger Whistle prosthetic tool. In case you have any further problems with Sekiro, go ahead and check out some of our other guides. Among others, we have Carp Scale Locations – How to Get Mask Fragment and Anayama The Peddler Quest.